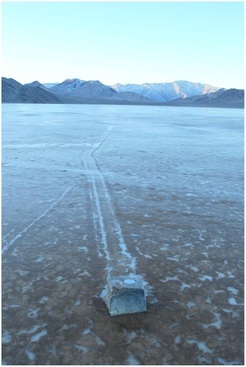 A Sailing Stone in Death Valley, CA: image from Norris R, Norris J, Lorenz R, Ray J, Jackson B (2014) "Sliding Rocks on Racetrack Playa, Death Valley National Park: First Observation of Rocks in Motion"
Stone unearthed last fall at Street Road, which we suspect is an old route marker, and which signifies Street Road's location for the L.A.N.D. project. Sailing stones are a seemingly magical geologic phenomenon, occurring in flat desert expanses: stones move, incrementally, over months or years, leaving long tracks in the sand, appearing mysteriously animated, alive. Geologists have come to understand that a combination of low friction sand surfaces, strong winds, and water and ice are the cause of these uncanny travels. A more poetic interpretation is taken as the guiding theme for our upcoming exhibition, Sailing Stones. These strange creatures can be seen as a metaphor for the larger landscapes (both natural and acculturated) that surround us, changing slowly, almost unnoticeably but significantly, over time. Causal relationships are hard to pin down and identify. Some shifts are through human agency, some through human obliviousness, and sometimes it's not clear at all. The exhibition is a direct descendent of the Street Road Rocks project, in which we provide a rock to anyone who would like to participate, and ask that they alter the rock in any way they want. Altered rocks have been contributed by local and international artists, local schoolchildren of various ages, and other friends of Street Road both living in the area and from far away. Last fall, when we had begun to accumulate a fair sized collection of altered rocks, we decided there was critical mass for an exhibition (though Street Road Rocks is ongoing). Egidija Ciricaite’s About Stones began when she broke her rock into pieces and mailed these to diasporan Pennsylvanians living around the world. This has developed into a playful artist’s book that both satirizes and subscribes to the possibility of ‘growing’ stones from one’s homeland to relieve feelings of loss among diaspora members. About Stones at Street Road is a multimedia work, involving printed matter and an installation of two 18 ft high video projections integrated with an indoor and outdoor land art installation. Kaori Homma's Meridian Stone Project marries her Homma Meridian Project to Street Road Rocks in an ongoing collaborative project, involving international artists from various places: a stone taken from Street Road, and carved with the longitudinal coordinate of the Greenwich Prime Meridian (0º0’0’’) is being mailed around the world, from artist to artist. Each artist participant photographs the stone, in a location geographically important to them, adding a personal narrative about place. In addition, we include work by two local artists. Pennsylvania artist and educator Julia Dooley presents Images from the Bottom of the World: based around her work as a research team member on a 2007 trip to Antarctica. The contintent's haunting beauty is unveiled through her projected photographs of otherworldly landforms and intricate icy details. Complementing this, Dooley's CryoZen Garden installation is based on a traditional Japanese karesansui garden, but with the introduction of melting land-based ice blocks it models the cryospheric processes of a warming global climate. Often regarded as a floating island of icebergs and penguins, Antarctica in reality is the world’s fifth largest continent, of sharp mountains and deep valleys overlain with an ice sheet two miles thick on average. In counterpoint to Dooley's work, Wilmington DE based José Luis Avila shows his photographs of the striking landscapes of Iceland. His images, projected 18 feet high and also in a series of smaller more intimate light boxes, present a stunning geography that is both harsh reality and magical otherness. Finally, LAND, a piece by Danish collective N55, turns a portion of our property into an open space which anyone is free to use. “LAND,” according to a manual by N55, “can be expanded by anybody who wants to add pieces of land to LAND. Formally, the parts of LAND remain the property of the persons participating in this way, but they guarantee that any person can stay in LAND and use it. " The marker for LAND is a flat bottomed stone, possibly an old road marker, unearthed on our site during a previous installation. Just like sailing stones as a phenomenon opens up a space in which what we accept as the nature of stone-immutability and permanence - is turned upside down, so do the works in the exhibition present scenarios which bring forth the tension between transience and permanence. They highlight the cultural constructs we impose onto landscape and place, and the fluidity inherent in the world as we experience it, even in something as seemingly fixed as stone. Open Friday 11am - 3pm or call 610-869-4712 or email to set up a visit, or, if you are driving by and see cars outside, just drop in. If you are far, far away, and can't visit in person, we do visits by Skype - email us to set up a virtual visit. We are on site multiple days a week and can accommodate most times. We acknowledge that we are on the ancestral lands of the Lenape, original people of the mid-Atlantic area, forced west by British and US governments. Most Delaware Indian tribe descendents are now located in Oklaholma, Wisconsin, and Ontario. Lenni Lenapes in Pennsylvania are not officially recognized as tribes by the United States, though an estimated 5000 Lenape Nation descendents live in the Delaware River area. We pay respects to the Lenape people both past and present. Please consider the many legacies of violence, displacement and settlement that form part of our collective histories. While increased public recognition of these legacies and processes of redress such as Canada's Truth and Reconciliation Commission are positive steps, concrete focus on return of land and land rights remains a distant horizon.